After catching a decent carp two days ago I was enthused to try again in the same place. This time it was overcast and a good deal windier than on the previous trip but still fairly mild. I noticed immediately that there were less fish showing than on my previous session and, more disturbingly, there was no accumulation of dust and scum in 'my corner'. Anyway, I stuck a crust on and lowered it into the margin. After about half an hour with no sign of interest I was beginning to lose my concentration (I often do). The only fish movement I'd seen was in the reed bed a few metres out. I reeled in, put on another crust, dunked it and pitched it out into the reeds. The braid billowed as I cast and draped itself over a twig about six feet above the water so I laid the rod down and tightened just enough to move the crust an inch or so. Again I waited. After about five minutes a fish nuzzled the crust and left it. Now I was all agog and five minutes later the bait was sucked in and I waited for the rod to bend before picking it up to feel a strong resistance. 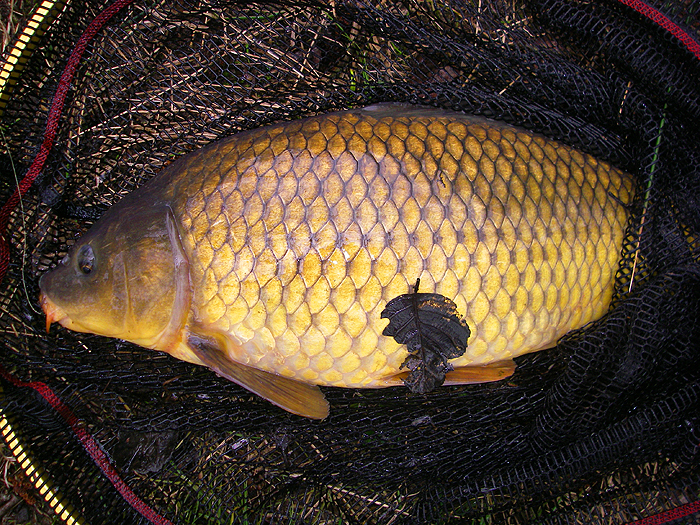 Now it turned into a bit of a tug of war as I tried to haul the carp out of the reeds. Eventually I succeeded and the fish lurched away to the left picking up a loose branch broken off an alder tree as it went. There's always a bit of excitement when you're catching carp. It was probably anothe five minutes before I was able to slide the fish over the rim of my net - a beautiful, golden scaled common of about eight pounds. Wonderful stuff! That evening I had a couple of bass on lures from the coast - a really good day!